Principal Scot Finch supervises the cafeteria during lunch. This is Finch's ninth year being a principal at Hebron. Life began for principal Scot Finch in Wichita Falls, in a trailer home with round ends. “We were the poor people in the trailer park,” Finch said. His parents, aged 18 and 19, got married soon after his mother graduated high school. In order to live a better life, his dad continued his education in Texas Tech Agricultural College and soon moved to Dallas after receiving a better job. After moving throughout Texas, the family settled in Wylie. Finch found an interest in athletics while playing Pee Wee football in elementary school. After entering Wylie High School, he played football, basketball and track. It was here Finch met Joe Longino, his head basketball coach and U.S. history teacher. Because Finch had a strained relationship with his dad, the coaches he had growing up held his dad’s place. 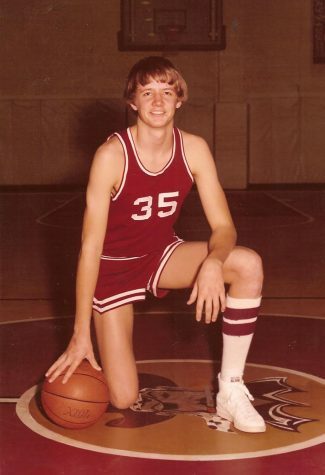 During his junior year of high school, Scot Finch poses for a basketball photo at Wylie High School. Finch was involved in track, football and basketball. After graduating high school in 1981, Finch enrolled at Texas Tech University wanting to be a park ranger. After his freshman year of college, Finch got a job at the Corps of Engineers as a park ranger over the summer, which lasted 25 years, at Lake Lavon. The interest of becoming a park ranger piqued because of his experience with the outdoors. Finch’s father was a fisherman and they lived near a lake during his childhood, giving him access to fishing, boating and hunting. During his third year in college, Finch had a change of heart. He changed his major to education because he wanted to do what his coach did for him. Before pursuing an education degree, Finch said people did not give teachers the respect they needed during his childhood, influencing him to steer away from that job path. While at Texas Tech, Finch’s roommate was a drum major who brought Bibles to school, which Finch said he found interesting. Talking to his roommate and other guys on the floor, Finch found an interest in Christianity. In October of 1983, Finch made the decision of committing his life to Christianity. After graduating from Texas Tech, Finch moved to the metroplex. With his teaching degree, Finch got a job at Williams High School, feeding into Plano East. After five years as a basketball, football and track coach and biology teacher at Williams, Finch was hired as an assistant principal in Huffines Middle School in Lewisville. Finch later moved onto Lewisville High School for five years as an assistant principal and received a principal’s job position at Durham Middle School. 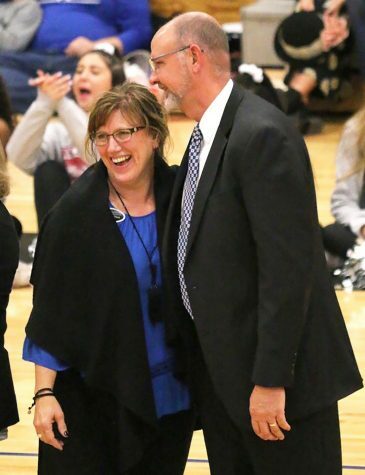 Principal Scot Finch and his wife Joanie celebrate at a school pep-rally. Joanie Finch is the principal of Arbor Creek Middle School. 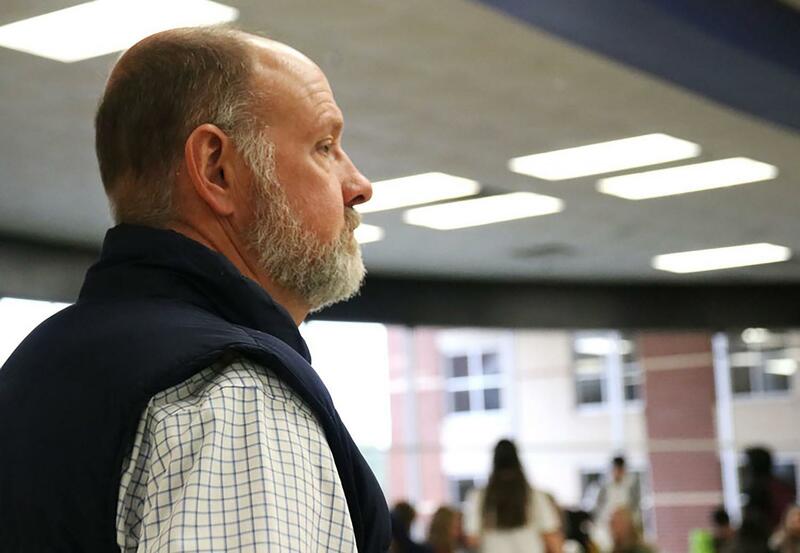 When Hugh Jones, Hebron’s first principal, retired over the summer of 2010, Finch received a phone call from Royce Cooper, former principal of LHS, informing him that a principal job position opened up at Hebron. Finch was in the middle of a desert in New Mexico with his wife when he received the phone call. Finch became the principal of Hebron in 2010 and is currently in his ninth year. Finch connects this serving attitude back to his Christian values. He said that the essence of being a good Christian is sacrifice and serving others. Finch is also an advocate for kindness, a trait that goes hand-in-hand with serving. The time period and culture during his childhood normalized bullying, but he found kind mentors and upperclassmen that changed that concept. Using that as an inspiration, Finch executes kind acts as a way to normalize kindness. Finch plans on staying at Hebron until retirement. He said he and his wife want to retire around the same time and move to their lake house at Cedar Creek Lake. Hands down one of the best principles I have ever had the opportunity to work for. My first year of teaching at Hebron it was probably around 6:15 pm and I was working on lesson plans. Mr. Finch came into my room, sat down, and asked me how I was doing. I was waiting for the other foot to drop and him tell me that I did something wrong. NOPE he was just walking around the school talking to teachers and seeing how their day was going. He is a quiet man but he is a man who’s heart speaks loudly by his caring actions.